As you’re preparing for your first snowfall, you’re probably wondering how to find the best sled for kids. With so many options, how do you find the perfect fit? That’s where we’ve come in. We’ve put together this list of some of the best sleds for your kids to have fun with this winter to give you a head start. Before we start looking at these amazing sleds, here are some things you should look for. Riders: How many people can fit on the sled? This will be important for you if you have more than one kid, or you want a sled that is large enough for you to ride it with them. Dimensions: How big is the sled? 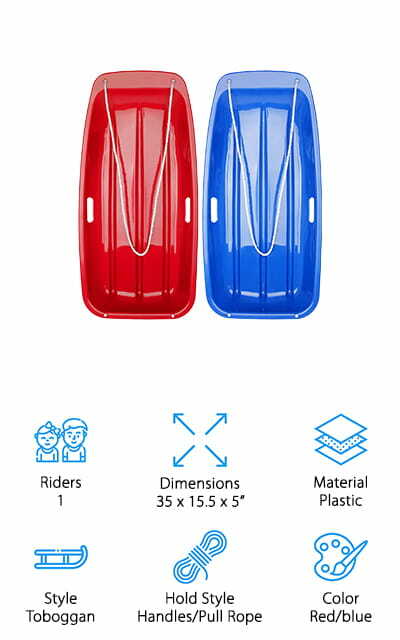 The size of the sled can tell what size child it’s meant for and will help you figure out how to transport it to your favorite sledding hill, especially if you have more than one. Material: What is the sled made of? Some have a more classic rail design, while others are made of plastic or other materials that will slide easier over snow and ice. Choose the material you like best. Style: The different sled styles can show you how the sled is meant to be used. Toboggan sleds are meant to be sat on, while luge sleds can be laid in. There are also classic sleds with metal rails. Hold Style: Some sleds have handles, while others are ‘steered’ with long ropes. We’ll let you know here which is hold style is on the sled, or if both are present. That way you have some idea of how the sled works. Color: What color is the sled? There are usually different options, which is handy if you have more than one child. If there are other options available, we’ll let you know in the description so you can choose your favorite. Now we can start showing you some of the top kid's sleds on the market right now. We’ve done all of our research and reviewed a ton of sleds in order to bring you only the best options for your winter fun! Our top pick and budget pick are our favorites, so check them out before you slide through the rest of the list. Let’s get started looking at these amazingly fun sleds! If you’ve got a classic sled in mind, you will definitely like our choice for the best snow sled for kids. The Flexible Flyer is the traditional sled that comes to mind, with steel runners and a natural wood deck to sit and lay on. This sled comes with red runners, perfect for holiday sledding. It’s compact at only 48-inches, the perfect size for your children to carry back up the hill when they’re done. It’s made of birch wood with powder-coated runners, which means that it’s durable as well as fun! The steering bar gives you a lot of control, and you can even attach a rope to the steering bar to make it easier for the kids to move around. When used on packed snow, this sled can go fast really quickly. With the added steering potential, this sled can really fly. Kids and adults can use it, with a weight limit of 250 pounds total. Franklin Sports makes this amazing kids winter sled. The Arctic Trails Sled is the first inflatable sled on our list. There are durable handles on the sides of the sled, making it safe and easy to maneuver down your favorite hills. 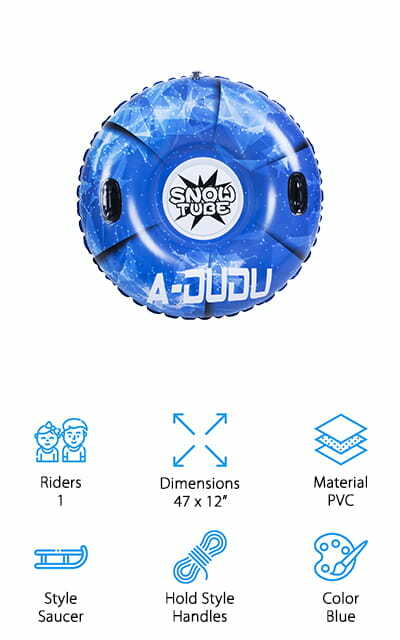 Since this inflatable sled is round, you have the added ability to spin while you slide, adding another dimension of fun to a popular winter pastime. This sled is lightweight and easy to carry, even for your smallest kids. You can use this sled solo or double down, so you can slide with a friend or with your kid easily. The PVC material that the sled is made of is freeze-proof so you don’t have to worry about the cold breaking it. 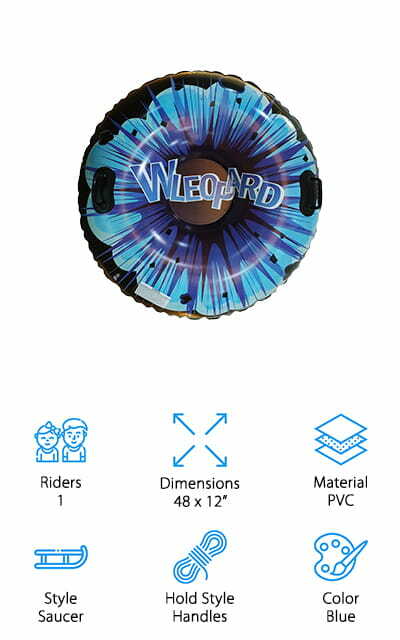 It inflates quickly, giving you hours of sledding fun with no additional work. We love everything about this inflatable sled, and we know that you and your family are going to love it too! 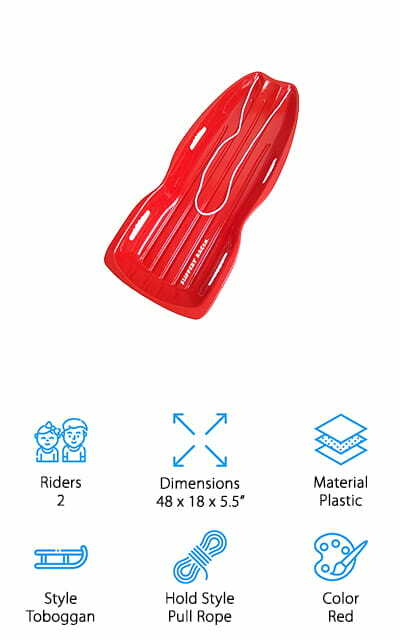 The Zipfy Freestyle Luge Sled will turn snow days into phenomenal memories. This is a luge sled, which means that you will lie down to use it. You can drop your heels in order to stop the sled or slow down, and it’s easy to maneuver and steer by leaning. There are handles to keep you secure on the sled as well. It offers a unique experience on this list because it is an entirely different type of sled. It’s made for riders of all ages because it’s compact and lightweight enough for even the smallest riders to carry around. Plus, the cushion makes it comfortable enough for everyone! You can slide down the slopes with fresh power and a packed snow base. It’s colorful and decorative and comes in a variety of colors including the blue shown here, as well as red, orange, green, pink, purple, and yellow. The weight capacity is 250 pounds for maximum speed. Sled Legs are a new craze that’s sweeping the sledding scene. These are not like the other sledding devices on our list. Instead of sitting inside a sled or laying on it, you strap these to your shins and you can glide down the hills on your knees! It’s a unique experience that only Sled Legs can offer – and it is a ton of fun. 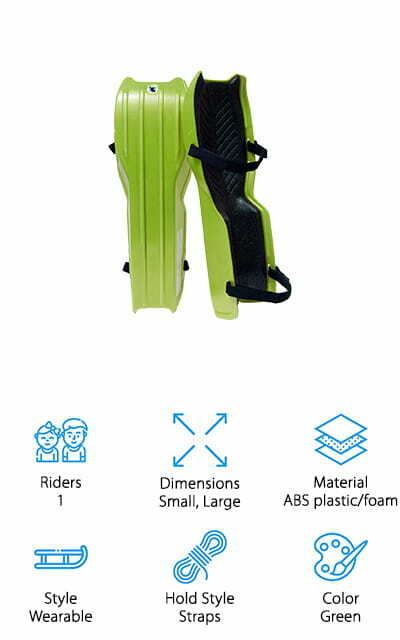 There are three sizes so that riders of all different heights and leg-types, with adjustable straps and a contoured surface to keep your legs comfortable and stable. There is a weight limit of about 250 pounds to keep you sledding on the surface of the snow, but otherwise, it’s completely adjustable for anyone. 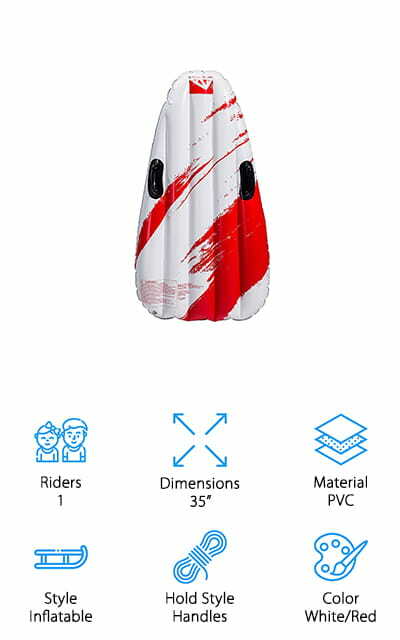 However, the small size is meant for riders between 4 and 5 feet tall and less than 125 pounds, while the large is meant for riders over 5 feet tall and carries the 250-pound weight limit for maximum fun! Up next is another saucer sled, this one from Wleopard. This snow tube is 48 inches in diameter and can hold up to 240 pounds before its performance is affected. It’s made of 16-gauge PVC that’s thick and treated with anti-cold technology so it won’t crack. It’s durable so the fun will last! Plus, they are made with anti-scratch materials so that even the iciest of sledding locations are okay. Hidden rocks won’t ruin the fun, either! You can inflate it really quickly with the single valve, with a pump or a hair dryer depending on your preference. It’s easy to get them set up and ready to go in minutes, and the double-locking valves will make sure that they stay tightly sealed through all of the fun. There are two grab handles to make sliding down the slopes easier and more secure so that your fun stays that way. This large-size tube is amazing fun! The defining feature for good sleds for kids depends on your personal preference, but you can’t go wrong with this classic toboggan sled by Bo-Toys. It’s a one-person sled, made of a heavy-duty plastic with built-in handles to make sure that you’re getting the best experience when you go sledding. It comes in a couple of different colors so you can choose different colors for your different children. 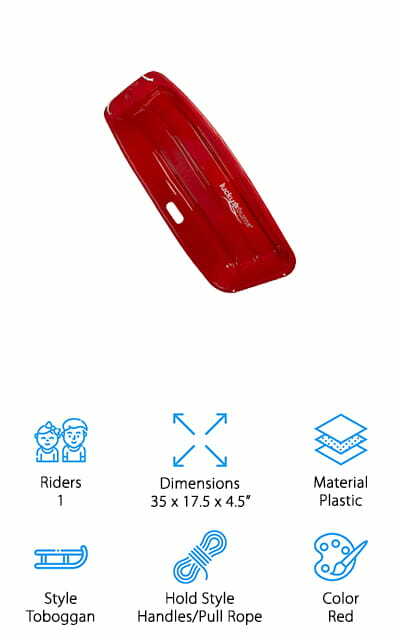 This sled is 48-inches long, perfect for big kids or for adult riders. There’s a pull rope included so that you can pull the sled back up the hill easier. This is especially useful for small children. It’s made of a durable plastic material that will hold up season after season, prolonging your fun! They won’t freeze or crack in the cold, either. These sleds come with a lifetime warranty from the manufacturer, so you know they stand behind their product. If you want something simple and classic, go with this toboggan. When you’re looking for some cool sleds for kids to use this winter, check out the Lofoson Sled Toboggan. This sled is 35 inches, long enough and wide enough for your children to ride without falling off. The edges are curved up to keep them on the sled better than straight sides would be. There are two easy-grip handles in the middle of the sled to help your kids steer and hold on tightly when going down the slopes. It also comes with a pull rope so that it’s easy for parents to drag the sled around with them for a full day of fun! This is a great feature for parents with younger children as well. This sled is lightweight enough to skim over the snow and for children to easily be able to drag it back up the hill when they reach the bottom. It’s weather resistant and great for those extremely cold days! 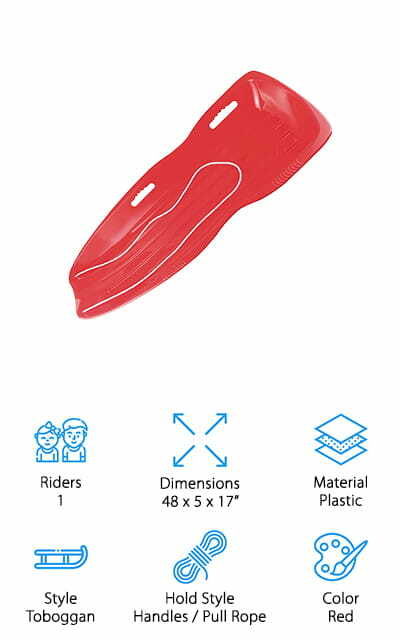 Lucky Bums toboggan sled comes in a variety of colors, including the normal red, as well as a light blue, pink, black, green, and medium blue so that you can choose your kid’s favorite color, and you can buy different colors for multiple children. This is a one-rider sled that has built-in handles that your child can hold tight to when they’re racing down the hill. It’s made of heavy-duty plastic that is cold-treated so it will hold up to cold temperatures and even tackle bumpy terrain like a champ. It also has a pull rope that you can attach to the handles, allowing you to transport and move the sled that much easier. The plastic on the bottom is slick and includes grooved channels to help increase your speed and the ability to carve through packed snow that much more efficiently. 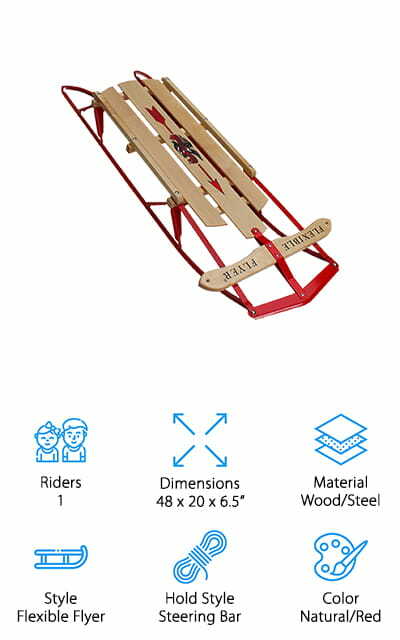 It’s a 35-inch long sled that your family is going to love this snowy season! 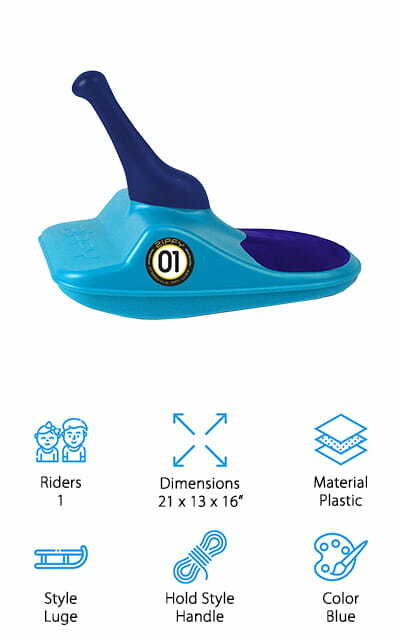 This toboggan sled by Slipper Racer can accommodate a maximum of two riders, so you can ride with your children or put both of your kids on the same sled. The entire sled is made with flexible plastic and coated with an ice and cold-resistant treatment to make sure that it’s durable and will last for season after season! It includes a pull rope so you can take it back up the hill when you’re finished with it and steer it easily. It has an aerodynamic shape to give you the most speed that you can possibly get, and it’s strong enough to not crack even on icy terrain. This sled is so durable that you can almost bend it completely in half without breaking it. That’s amazingly safe sledding for your kids! It also comes in green and blue. It’s one of the best cheap sleds for kids that we could find, and we’re sure you will love it! The A-DUDU Snow Tub is one of the greatest sleds for big kids that we could find during our research. It’s big enough for adults and children, at a full 47 inches across. It’s a round saucer sled with environmental protection PVC material. All of the seams are durable, and this sled can hold up to 500 pounds while still delivering an amazing experience. You can use an air pump to inflate this snow tube, or you can use a hair dryer to allow it to reach its full potential. That’s pretty amazing! The extreme tolerance for cold temperatures comes from the material that it’s made of, giving you the freedom to use it as much as you want. It has a single inflatable point rather than having three different ports, which is great for getting it blown up quickly and efficiently. Plus, all of the valves are double-locking so that air is sealed tightly inside for the long haul.